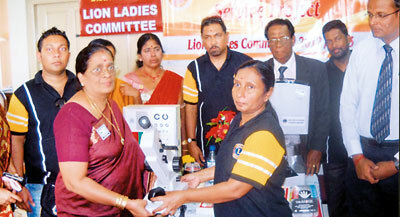 A slit lamp microscope with tonometer and a binocular indirect opthalmoscope were donated by the Lion Ladies Committee of Lions Clubs International District 306 B 1 to the Base Hospital Tellipalai, Jaffna to establish an Eye Clinic, at the request of the Medical Superintendent Dr. M. Umashankar. The hospital is one of four Base Hospitals in the district. On an average 4000 clinic patients and 7000 outdoor patients are treated every month and about 700 are admitted to the wards. The chairperson of Lion Ladies Committee Lion Lady Sarva Shanmuganathan handing over the Eye Clinic equipment to the clinic staff in the presence of the Medical Superintendent Dr. M. Umashankar and Lions District Governor S.S. Thangarajah.